Dreamcoat FlooringCommercial FlooringWhy Should You Invest in Epoxy Flooring? One of the most important parts of any commercial or residential complex is its flooring. 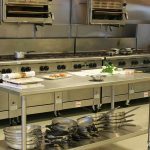 No matter if it’s a commercial floor, club, warehouse, school, restaurant, garage or store, sound flooring enhances the overall ambiance and safety of the place. A building with beautiful aesthetics projects an inviting aura that everyone is sure to appreciate. Epoxy is a type of coating that is self-leveling, which means whether the existing concrete floor is old or new, the epoxy will go on smoothly creating a smooth finish. 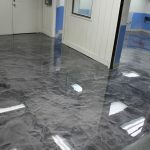 In areas that experience regular wear and tear and daily foot traffic, like kitchens, pathways, washrooms; as well as work spaces like garages and basements, an epoxy floor offers unparalleled strength and durability, including resistance to household chemicals, spills, stains, and scratches. It is very easy to clean and maintain epoxy flooring. Since it is nonporous, it can be easily wiped down or mopped to remove dirt or any mess that might have been made. The high gloss finish allows for easy cleaning meaning dirt will additionally not get trapped. Commercial epoxy is excellent for businesses because its floor coating is fire impact and slip resistant thereby greatly improving your safety standards. It is easy to maintain, durable and environmentally friendly making it a cost efficient option for commercial use. Also, due to the reflective qualities of lighter epoxy floor coatings, less indoor lighting and energy will be required to illuminate rooms making for greener, more energy efficient buildings. Epoxy flooring choices now come in a wide array of colors and finishes, imitating marble, granite, and stonework along with traditional monochromatic schemes, and flecked design options. 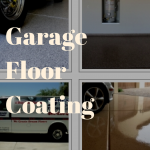 Epoxy garage floor coatings last for years, no matter how often you drive over them. A well-reputed company will use industrial grade materials, including durable polyurethanes, polyaspartics, polyureas and epoxies for commercial or residential garages that will make it long lasting and give it a smooth finish. After evaluating what epoxy floors can do to your property’s aesthetic appeal, protection, and long-term resale value, epoxy comes out as a clear winner, offering exceptional returns on your investment.